This kind of calculation can easily be done in a spreadsheet program, but formulas in ProcessMaker grids do not allow it. This code defines the roundToFixed() function which is used to set the "balance" to exactly two decimal points. The recalculateGrid() function is called when the DynaForm loads, when a value in the grid is changed by the user, and when the user deletes a row in the grid. Its code loops through the entire grid, recalculating the "balance" for each line. The column numbers are hard coded, where column 1 is the "credit" field, column 2 is the "debit" field, and column 3 is the "balance". These numbers need to be changed if the field order is changed in the grid. 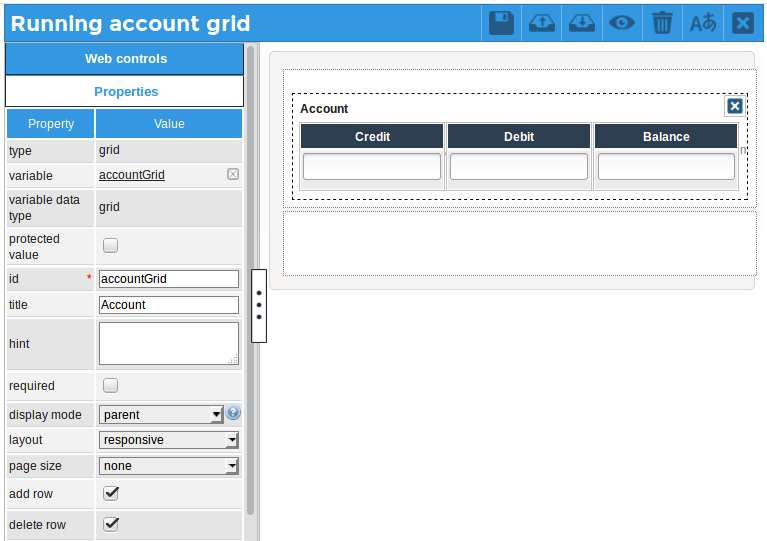 Unfortunately, the grid.setValue() function doesn't display two decimal numbers if they are 0. A value like "34.00" will be displayed as "34". To get around this problem, the balance is inserted directly in the <span> where it is displayed in the grid. When the user fills out the form, it will will always display the two decimal numbers in the "balance" field, no matter whether the "credit" and "debit" fields have zero, one or four decimal numbers. This page was last edited on 8 September 2018, at 00:20.